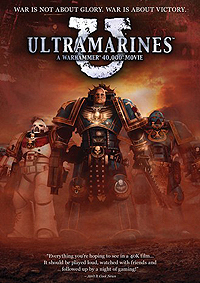 000 Movie Ultramarines: A Warhammer 40 (2010) - Sci-fi-central.com.  UK  2010  76m   Directed by: Martyn Pick.  Starring: Terence Stamp, John Hurt, Sean Pertwee, Steven Waddington, Donald Sumpter, Johnny Harris, Ben Bishop, Chris Finney, Gary Martin.  Music by: Adam Harvey. I've always been ambivalent about the idea of there being a Warhammer 40,000 movie. It sounds like a wonderful idea, yes, but the setting that's been built up over the decades is so detailed and varied that I can't help but feel it couldn't be done justice in a single feature length narrative. The universe is also so harsh, alienating, sombre and overflowing with religious mania and entropic hopelessness that trying to appeal to a mainstream SF audience would probably gut it of the things that made it unique. So, when Games Workshop said they were creating a Warhammer 40,000 movie as a direct-to-DVD film available through mail order... I wouldn't say I was looking forward to it per se, but it did pique my interest. They're selling it directly to a limited audience of fans who already like it, ergo they can cut loose and deliver something that's true to the universe without worrying about demographics. And Dan Abnett's writing it! So, even if it does reduce the entire universe to a couple of pitched battles and a squad of not-very-interesting space marines, it'll at least be true to the material. A fanservice-y animated companion to the game, like the art books and source books they release, only in movie form. Even on these terms, I was disappointed. Aside from the superficial details, the story takes no advantage of the setting - a squad of soldiers go to a featureless desert planet to investigate a mysterious signal, wander around, have a firefight, rescue some guys, have another firefight, escape and then have a pointless non-fire fight after the predictable last-act "twist". Yeah, the spaceship has stained-glass windows and they detect the monsters using an enchanted banner rather than a bio-scanner, but so what? Why not give us something we can't get in Every Direct To DVD SF Movie Ever? We could be seeing the feudal system that creates the Ultramarines. See the role they play on their home world, as defenders and as aristocrats. See how they're selected, what happens to them, what drives them, whether they ever question their belief system, how well they get on with factions who interpret scripture differently - in other words, it could have been ABOUT them while maintaining a strong action suspense narrative. The setting calls for something along the lines of Kingdom of Heaven, or The Seventh Seal, or even Alien 3. Instead, it's about a squad of identical blue dudes shooting a squad of identical black dudes. But that's not the big problem with Ultramarines. The big problem with Ultramarines is that it's incredibly boring. The first half an hour - of a seventy-six minute film! - consists almost entirely of the characters wandering around a featureless desert without finding anything. There's no mounting tension, or sense of discovery, or even character interaction; it's like watching someone get lost in a video game and not know where to go next. I'm not joking when I say that the big turning point at the end of act one is the discovery that some people were killed during a war. Show the audience a pile of bodies in a setting where there normally wouldn't be a pile of bodies and you've got their attention. Show them a pile of bodies in a war zone and... well, that's business as usual, isn't it? There's a hint of something potentially interesting and disturbing in these scenes, because the bodies have been mutilated and arranged in what appears to be a demonic symbol, but it's never really dwelt on, it just exists on the edge of the frame in a couple of shots. There could have been some real suspense built up here, but it comes across as just another day in the Ultramarines. If the characters aren't affected by what's happening, then why should we be? Almost every character in this movie wears identical blue armour, including a helmet which covers their face. Because they all lead lives of fanatical, monastic devotion to the Emperor of Mankind, there are no differing views beyond "Let's rescue the captain" "No, it's too dangerous", which means no conflict, which means no drama. We can't tell who's who and we don't know what they're feeling, so how are we supposed to care about what's going on? When the "hero" character defeats the demon at the end, it's meant to be a moment of apotheosis for him, except I honestly couldn't remember what he'd done prior to this point or why his heroism was more notable than anyone else's - even with their helmets off, they're all lantern-jawed white men with shaven heads and British accents. Now, there's a (hugely predictable, mostly because the plot's finished fifteen minutes before the movie has) "twist" finale in which one of the marines is revealed to have been possessed by a demon. Fine, "daemon". This strand of the plot exists solely to pad out the story to feature length, but had some more attention been paid to it then we might, MIGHT have had a decent story going. Show how someone raised for a life of pious devotion can fall and become the thing he's been fighting. Does he doubt his faith? Has a life of poverty and chastity left him unfulfilled? Was his zealotry really just an outlet for the uncontrollable rage of a psychotic monster? Is he fighting against it, or does he enjoy the power? Not a clue, he just got possessed. The animation isn't great. It's not the overall quality that's the issue, it's that nothing moves seems to have any weight or physical presence. These guys are in what amounts to plate mail armour, but they're jumping around like they're on the moon. This totally destroys any threat generated by their presence - they seem hollow, not imposing. Review by Richard Pilbeam from the Internet Movie Database.